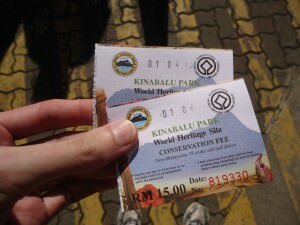 How Much Does it Cost to Climb Mount Kinabalu in Malaysia? 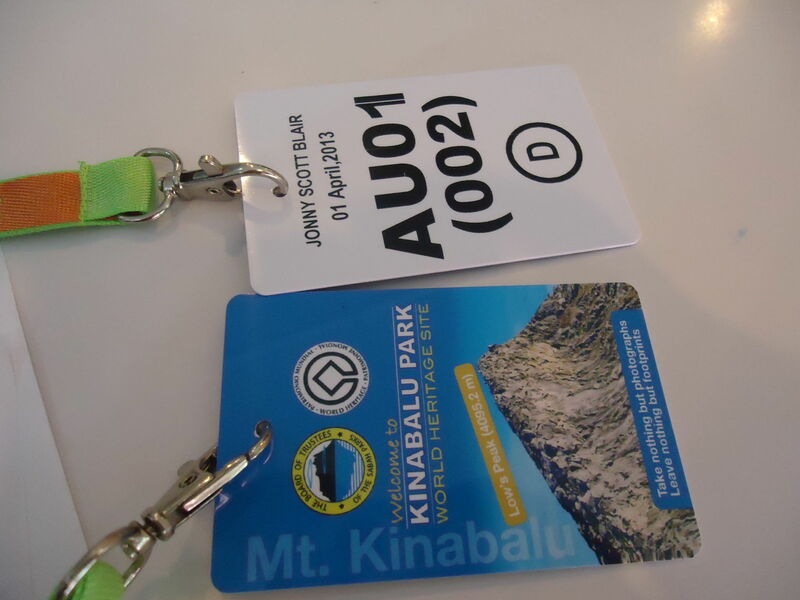 Reaching the summit of Mount Kinabalu but how much does it cost? I recently did the immense hike to the summit of Mount Kinabalu in Malaysia, Borneo so expect a few forthcoming posts on that adventure! 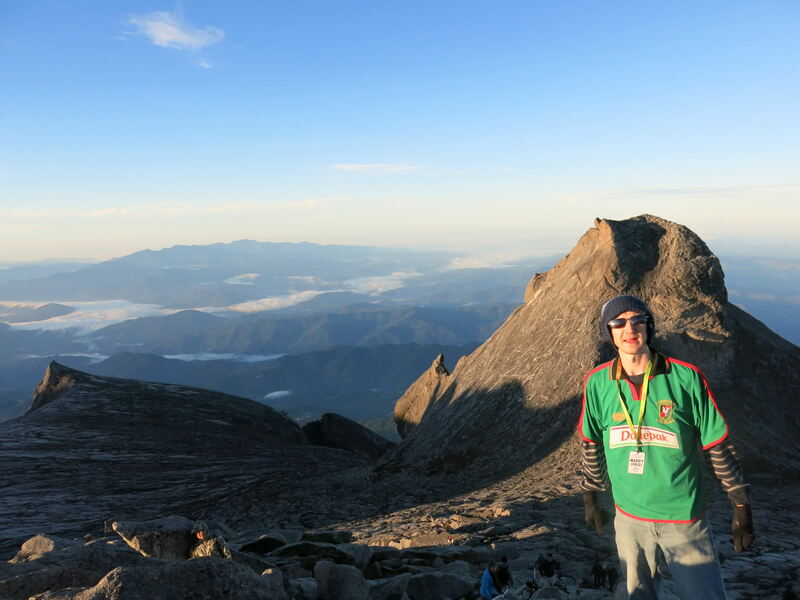 First of all the important stuff – how much does it cost to climb Mount Kinabalu in Malaysia, on the island on Borneo? That’s what everyone really wants to know. Here’s a pretty thorough breakdown of all the compulsory costs first and foremost, I will detail on a separate post how to book the actual hike…for the basis of this post I start off having already paid my deposit online and have just arrived at the entrance to Mount Kinabalu National Park. 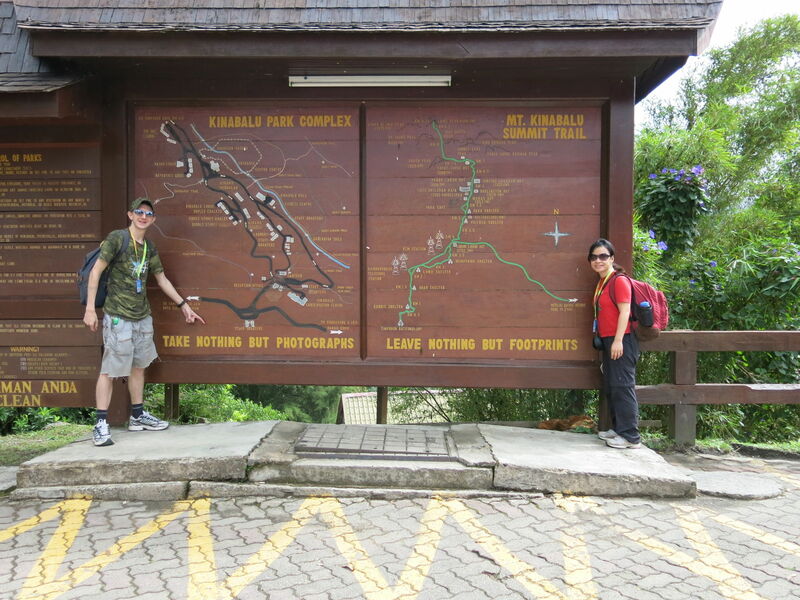 Arrival at the entrance to Mount Kinabalu National Park with my girlfriend just before the hike. 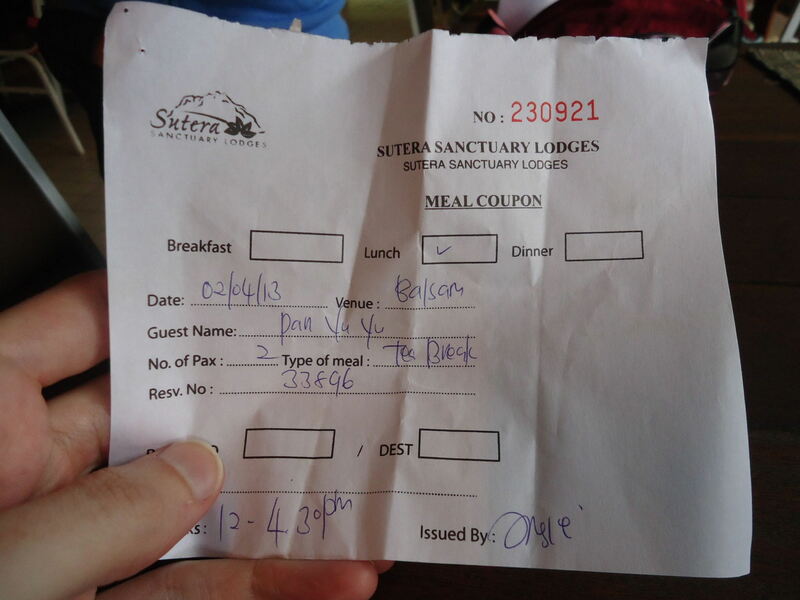 A whopping deposit of 577 Malaysian Ringitts is mandatorily payable in advance when you book your trip through Sutera Sanctuary Lodges (this is the only way to book it by the way – they basically have a monopoly over Laban Rata and the entire hike as far as I can tell). This is the first thing you have to pay when you walk up to the entrance to Mount Kinabalu National Park. The cost is 15 Ringitts and you get a ticket. You are now officially permitted inside the National Park for the hike. Pick up your meal vouchers at the entrance – there’s one for each meal. We noticed that other people had other lunches such as fried rice – so the company you book with may also vary the lunch you get given. 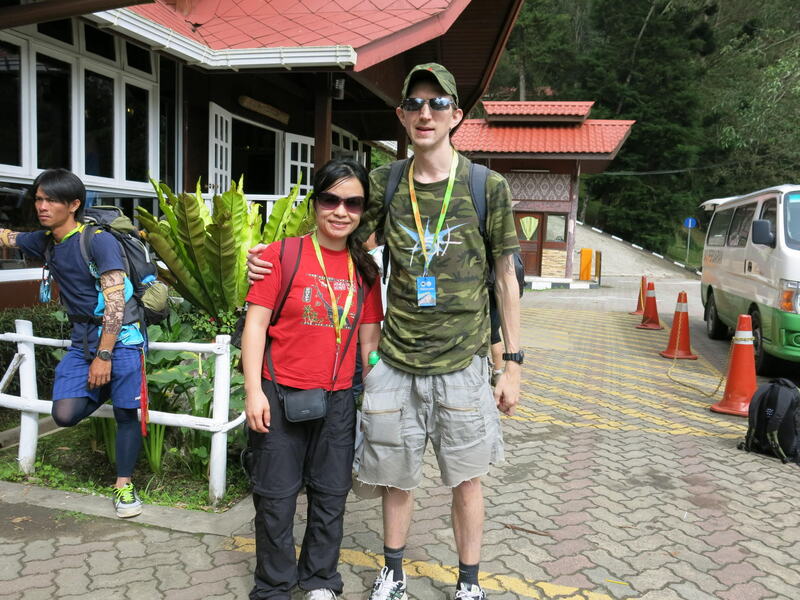 You collect the lunch from the restaurant which is down the steps at the main entrance to Kinabalu National Park. 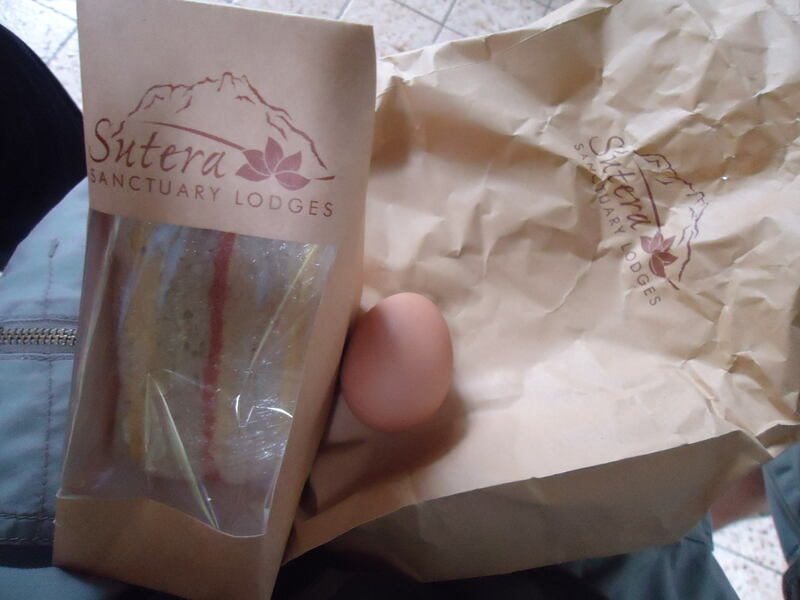 The packed lunch for day 1 is given to you on arrival at the entrance and included in the deposit price. This is a plastic card which hangs round your neck. It will have your name and number on it for the hike. You will need to pay 100 Malaysian Ringitts. 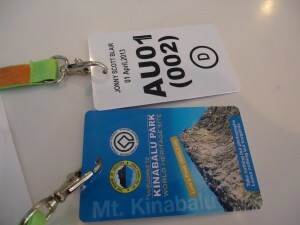 My hiking permit for Mount Kinabalu – a tag that you wear round your neck – officially it costs 100 Ringitts though this is also included in the initial deposit. You will need to have hiking insurance – this is included in the deposit you have already paid. You will need to pay for a guide to accompany you up the mountain. This fee is compulsory and unavoidable. 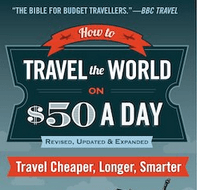 Even if you’re travelling alone, you will need to pay for one guide. 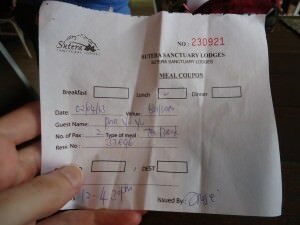 The cost is 128 Malaysian Ringitts per guide. There were two of us so this cost us 64 Malaysian Ringitts each. 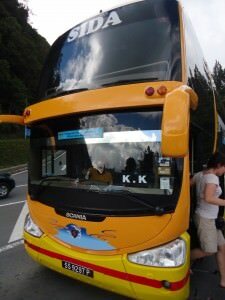 You could cut the cost by travelling in a group I’d imagine. Everybody will be staying in the mountain village of Laban Rata. There is one main building there and several smaller huts. 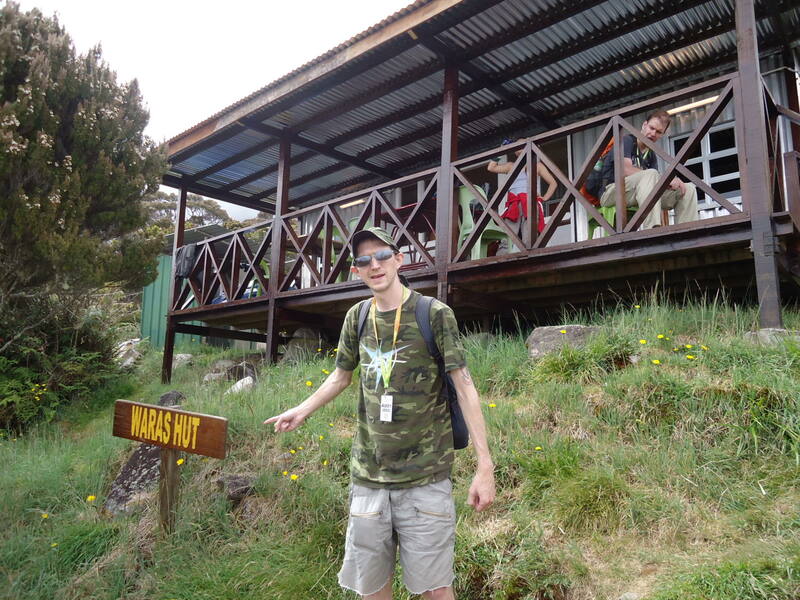 We stayed in the Waras Hut, which is the first hut you encounter on the hike up, I have no idea if this was cheaper than the main building but the rumour is all the accommodation is the same price – it’s included in your bulk deposit so nobody really knows. Arrival at the Waras Hut in Laban Rata – your accomodation is also included in the lofty deposit! 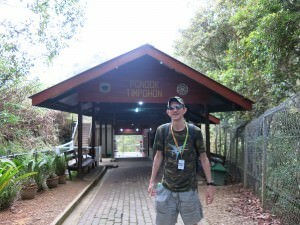 You will need to get a shared shuttle bus from the entrance of Kinabalu National Park to Timpohon Gate, which is where the hike starts. The cost of this is 16.50 Malaysian Ringitts for one person for a return journey. This is what we paid and you should too, even if you have heard it’s 16.50 for one way only – it should be your return shuttle bus too. 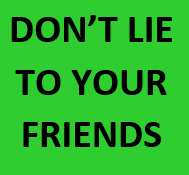 Please note that. 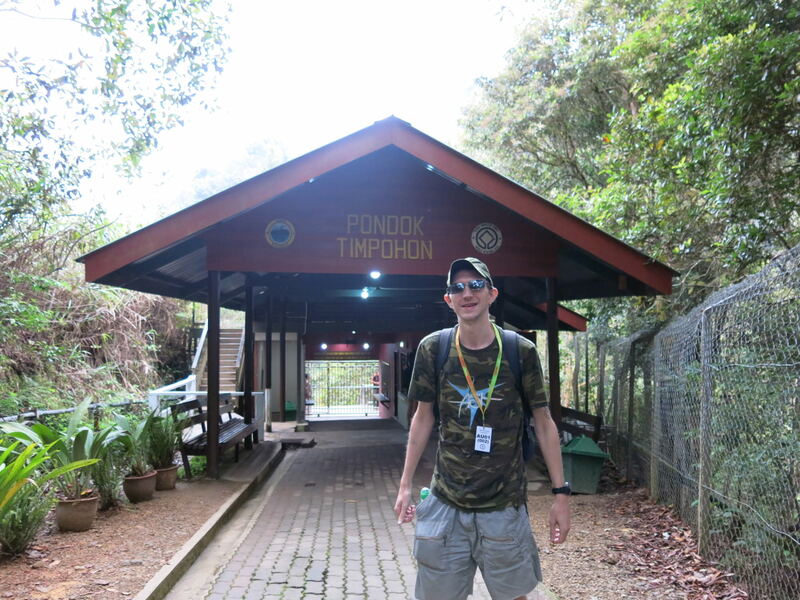 At Timpohon Gate all ready to go to start the hike to the summit of Mount Kinabalu! 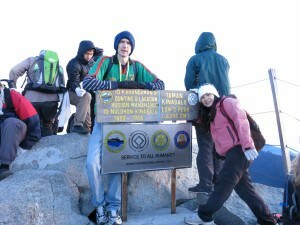 The Total: How Much Does it cost to Climb Mount Kinabalu? 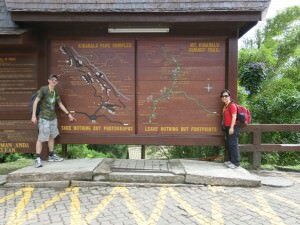 OK so those 8 things are the compulsory 8 things you need to do the hike. Well to be honest you could avoid number 8 by walking to Timpohon Gate, but the $5 US Dollars is worth it believe me – you dont want to walk along roads before the hike even begins and then have to walk back along roads after the hike, so this $5 is the least of your worries – we didn’t meet anyone who skipped the cheap shuttle bus return. Even the mountain guides and porters take them. You could also go up and down in a day if you really want and avoid the accommodation fees but then you’d miss sunrise and the whole point of doing it over two days and spending a night up on the mountain!! 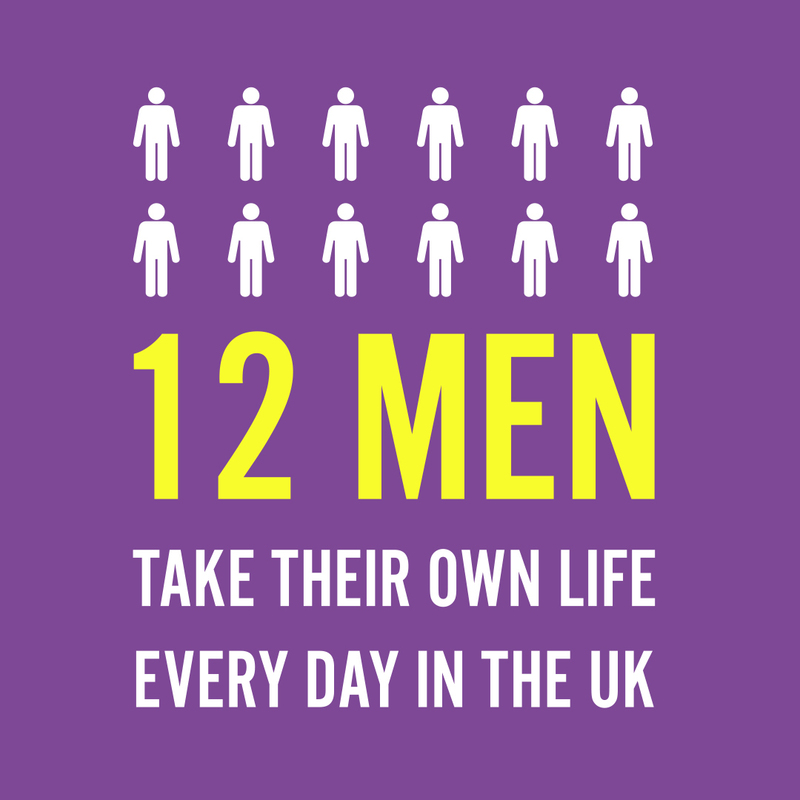 That’s a whopping total and it has gone up incredibly since 2009. BUT it’s what you have to pay nowadays and it’s worth it believe me! 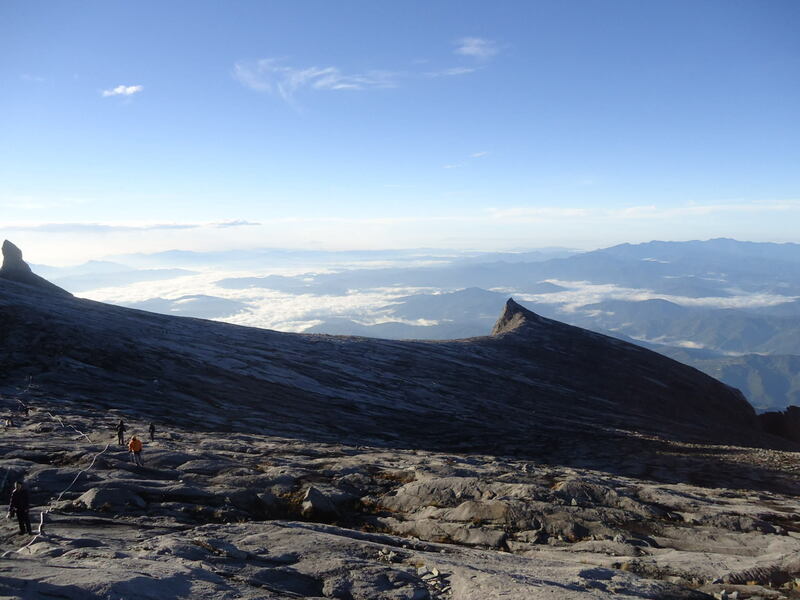 You’ll forget how much you spent when you see the immense views from the summit of Mount Kinabalu!! (you also need a headlight and gloves for the hike – please don’t forget to take them as these are expensive to buy in and around the mountain and at Laban Rata – buy them for cheap in Kota Kinabalu or own them already). The luxuries I bought at Laban Rata!!! 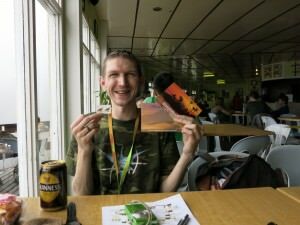 A tin of Guinness (and foreign extra at that) for a whopping $8 US dollars and stamps and postcards. BUT WORTH IT! For me that works out at 789 Malaysian Ringitts or $259 US Dollars in total including my luxuries and transport there and back, and the tip. So what are you waiting for? For under $260 US Dollars you get everything sorted for 2 days and have the luxury of a Guinness, yes the price is a lot steeper than it used to be but when you get to the summit for sunrise it will be worth it, believe me. 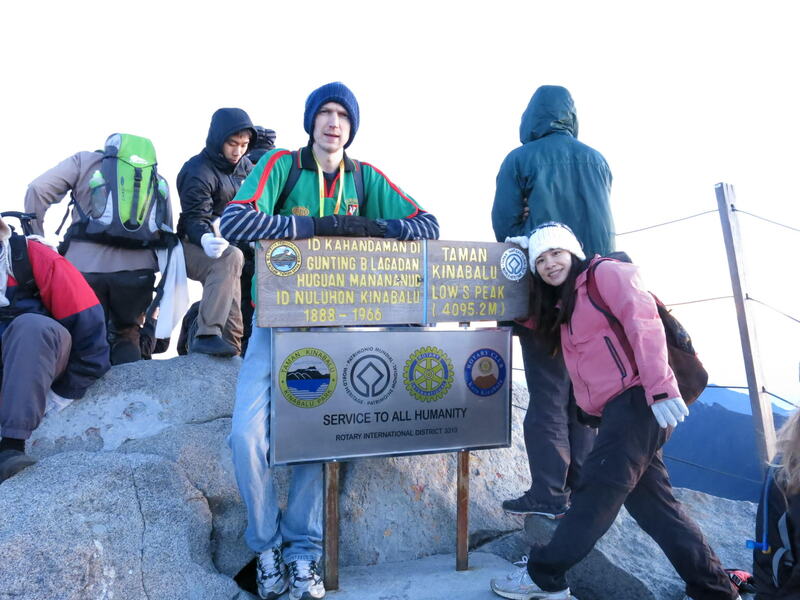 Happiness at the summit of Mount Kinabalu, over 4,000 metres above sea level! Well worth the hike! 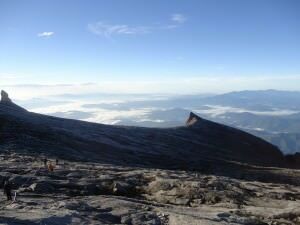 This entry was posted in Asia, Borneo, Destinations, Kota Kinabalu, Malaysia, Mount Kinabalu, Sabah, World Heritage Sites. Bookmark the permalink. A Guinness up there! Now that’s flashpacking. Ho were your legs after the hike (& don’t lie). Hi, thanks for tons of useful info!! However, i would like to ask you where do book and pay deposit? Link you provided leads to generic info page about park. Could you please make this part clearer? Again, thanks a lot for all info!